The Psychology Behind Loyalty Programs. Many companies use a reward system or loyalty program in an attempt to make customers more devoted. Top loyalty programs from successful retailers such as Sephora and Amazon have made remarkable impacts on their ability to sustain and gain a loyal customer base. Reward programs entice people to spend more and shop more often. Continue reading on to learn about the psychological reasons behind this idea and how understanding the psychological aspects can improve your loyalty programs. A good loyalty program can increase consumer spending. It’s as simple as that. These programs can give customers a boost in motivation that makes them want to make more purchases. This is because they have a reward to work for an ‘end goal’ such as a special discount, free product or maybe even a cash bonus. Often companies will offer special sales for people who are a part of the rewards programs. An example of this is a sale giving customers ‘double the points’ where customers will receive 2 times the points for each purchase. Deals like this give customers a sense of urgency and the feel that they need to purchase because they are getting a great deal. In reality that may or may not be true. Urgency combined with reward incentives (like points) leads customers who may not have even made a purchase to spend because of the motivation and these programs can deliver. Positive reinforcement is something we all experience and use, through many different situations in our lives. When we train our dogs, we use positive reinforcement by giving them treats when they do something favorable like alerting us when they want to go outside. We use it when raising children to commend them for doing a good job. We receive positive reinforcement at work when we get a bonus or promotion for putting in hard work every day. A reward system or loyalty program is a great example of how positive reinforcement is used for customers, in rewarding them for positive consumer behavior primarily spending money. The effects of positive reinforcements have been studied for decades. One of the most notable studies of positive reinforcement was conducted by psychologist B.F. Skinner. Skinner placed a rat in a specialized box he designed. There was a lever in the box that when pressed, released food. Once the rat realized that food was released upon pressing the lever, the rat began going directly towards the lever to get food at each trial. The rat’s behavior was positively reinforced for pressing the lever. This positive reinforcement made the rat act how Skinner wanted it to. Loyalty Programs are a great tactic to use to get your customers to act a certain way. They entice customers to spend more and push them to become a more loyal customer. When consumers understand that making purchases are positively reinforced by receiving points, special deals or prizes, they will continue to purchase from that brand. Why purchase a product at one store when you can shop somewhere else and get points for your purchase that can be redeemed? A successful rewards program will make customers choose your brand over another, even when they offer the exact same products and similar prices. On the flip side, negative reinforcement also can have an influence on a customer’s loyalty to a specific brand. Just like reward increases the likeliness of a behavior, punishment weakens the frequency of an unwanted behavior. For example, many brands have multiple levels of their loyalty programs. The higher the level, the more exclusive, exciting and expensive the rewards are. Usually, you reach these premium levels by spending more money. If someone’s status level is threatened due to a lack of spending, customers may feel inclined to spend to avoid a negative outcome. By not signing up for a rewards program, which is often completely free to join, customers will not receive bonuses, gifts, and other coupons. In this case, the negative behavior (not being a part of a loyalty program) makes them lose out on exclusive offers. That feeling of being ‘left out’ may be enough to get them to join in. 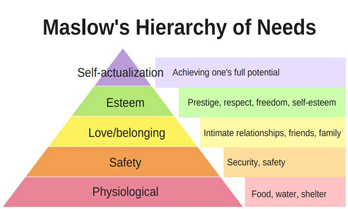 In nearly every introductory psychology course, Maslow’s Hierarchy of Needs will come up. The pyramid outlines human needs, categorizing them from most basic to most complex. The idea is to reach self-actualization which basically means, to be the best we can possibly be. To achieve this level, you need to successfully achieve each lower level of the pyramid, starting with basic needs such as food, water, and shelter, progressing to security and safety, relationships and self-respect. These needs can be applied to a successful customer loyalty program. The higher the need on the pyramid that you can satisfy is, the more loyal to your brand your customers will tend to be. You can have a great product but if it only satisfies a basic need, there is probably nothing stopping your customer from jumping ship when a better product comes along. We see this type of customer reaction to brands selling day-to-day goods such as paper towels and tissues. There is very little differentiation between these products, leading consumers to choose products more based on the price. Once you come to reach some psychological needs and create real feelings towards your brand rather than just the opinion that your product is ‘good,’ real loyalty begins to shine through. When customers feel a sense of belonging and connection when thinking of your brand, they are significantly less likely to leave for a competitor’s product. At Agilence, we believe that understanding the psychological aspect behind loyalty programs is essential in ensuring that these programs are tailored to your specific target’s needs and wants. By successfully utilizing a loyalty program, companies can not only incentivize customers to make purchases and spend more but also gain valuable information about their shopping habits that they can use to further improve their performance. Keneavy Krenzin is the Product Manager at Agilence. 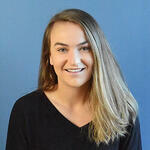 Her expertise ranges from developing an intuitive customer-driven tool to in-depth customer analyses. She has spent her career working with data to help retailers optimize their practices. Her passion is for clear designs, whether in product features or in customer reporting. In her spare time, Keneavy can either be found on the rugby pitch or cheering on the Philadelphia 76ers. Welcome to the Agilence blog! Your one-stop shop for the latest vertical-business intelligence and data analytics trends, industry insights, community updates, and 20/20 product news.